Responding to customer requests, this large shoulder bag kit is adapted from our popular little Edale design, and is one of our earliest knit-and-felt kits. 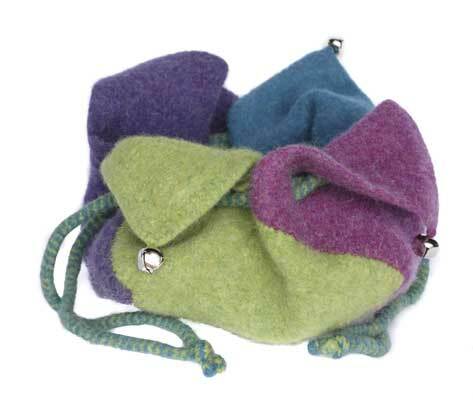 The kit contains 350g of wool and a magnetic clasp to fasten the finished bag. Three colour options are offered — Blueberry, Loganberry and Pumice. These kits come with a natural Kraft brown carrier illustrated by a large decorative Sheepfold label on the front and a photo label tied to the handle to show the finished bag — ideal as a gift either as a kit or as a completed item. But you may be tempted to keep it for yourself. If so, you can buy more wool from our heather range to make a second one to give away! 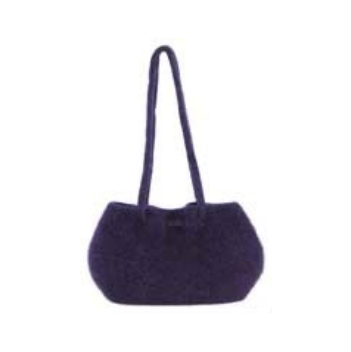 To knit this ever-popular bag you will need a pair of 5.5 mm knitting needles and a 5.5 mm circular needle, not to mention an enthusiasm for British wool! The long I-cord handle is knitted with 4.5 mm double pointed needles. Stitch markers are useful too. The ‘hard work’ of felting is easily done in your washing machine; such is the simplicity of knit-and-felt. The finished size of examples shown is approximately 45 cm x 26 cm x 14 cm (width x height x depth) depending on how far you take the felting process. Many customers have shown us their finished bags, decorated in wonderfully creative ways. How about a bit of needle felting, embroidery or a selection of brooches and buttons?